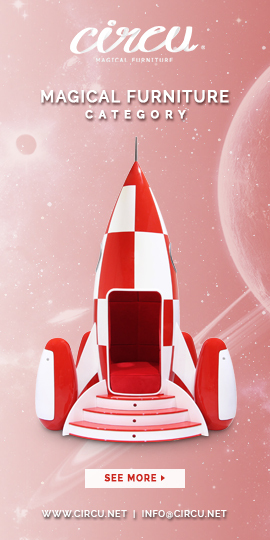 If you moms and dads are looking for the best kids bedroom furniture idea to create the perfect ambiance for a quiet and good sleep night and still decorate their bedrooms with an original playful furniture piece, Kids Bedroom Ideas is gonna to show you the coolest Sky B Plane Bed, another magical furniture created by CIRCU. Take a peek at this beauty! Sky B Plane Bed was inspired by Disney movie “Planes”, in which Leadbottom is a puttering old biplane and a grumbling taskmaster. With a creative and playful design, the toddler bed makes the crib-to-bed transition as painless as possible. The wings have convenient storage compartment and the interior of bed is made of velvet upholstery. The main structure (wings and body) is made of fiberglass. Propeller in real wood and the wheels are made of rubber. CIRCU’s world is full of magic and fantasy, a place where children’s dreams turn into reality, providing ways to create rooms where children fall asleep playing, surrounded by life and joy. The brand’s vision is focused on being part of the child’s world, being present in the most ambitious, luxurious and charming decoration projects and interiors for children.